Earlier this week the Huffington Post proclaimed Obama caved on giving tax cuts to the rich. Previously Economist Alan Blinder declared extending Bush tax cuts will not create jobs. President Barack Obama's top adviser suggested to The Huffington Post late Wednesday that the administration is ready to accept an across-the-board, temporary continuation of steep Bush-era tax cuts, including those for the wealthiest taxpayers. The infamous Bush tax cuts, what are they exactly? Below are the tax rates for 2010. Then the capital gains tax for 5 years from 10% to 8% and the top capital gains went from 20% to 15%. There are a host of others but these are the ones most talked about. The Obama administration's plan is to roll back income taxes to 39.7% for not only the current 35% but also some in the 33% tax bracket (those earning $200,000 or more). It's unclear if they plan on rolling back capital gains, which is where most of the uber rich, especially hedge funds, are not paying taxes. The Associated Press has a summary on the bush tax cuts if all are left to expire. There is a lot of research around GDP multipliers and tax cuts. We have on one hand claims that tax cuts generate GDP, economic growth, on the other, tax cuts increase the deficit and in terms of jobs, these tax cuts didn't do much. Do tax cuts pay for themselves? Do tax cuts create jobs? If so, what kind of tax cuts? For all of the rhetoric it seems few realize about 36% of the Stimulus was tax cuts. From the BEA, there were $120.1 billion each quarter in personal tax cuts from the Stimulus. A huge part of the problem is how all the tax cuts are lumped together. Take this as an example, Deutsche Bank claims if the Bush tax cuts expire, the recovery will die. Ooooh, scary. Which tax cuts? The top, the middle, the bottom? What about the Stimulus tax cuts? This is hugely political on the real effect on jobs and the reason is (obviously) GDP multipliers haven't been holding so great by the statistics versus the theory. From the Stimulus, the GDP multiplier for a tax cut to the rich was 0.1. The CBO reported the Stimulus (ARRA) kept the unemployment rate 0.7 to 1.7 percentage points lower and added between 1.7% and 4.5% GDP. So, if this is true, assuredly those results are not from tax cuts to the rich? How do we accurately estimate? Well, if the jobs created during the Bush administration are any measure, it appears other economic factors override the claim tax cuts are correlated to job growth. One thing is certain, tax cuts are correlated to deficits and debt. Right now we have op-eds claiming tax cuts for the rich are Stimulus, while others are saying take that savings and turn it into real investments via the private sector. Now that is the problem with the original Stimulus, it wasn't directed enough into specific agendas, such as requiring companies hire Americans, invest in America or that Green jobs funds had to be only used in the United States. (as examples). The PEW Economic Policy Group also analyzed the tax cuts and it's affects on the deficit and debt. Here is their graph of their results. Note, one thing many are forgetting is a way out of debt is to grow your way out of it and that's increasing jobs and GDP. So how, exactly, did a deficit-cutting commission become a commission whose first priority is cutting tax rates, with deficit reduction literally at the bottom of the list? Actually, though, what the co-chairmen are proposing is a mixture of tax cuts and tax increases — tax cuts for the wealthy, tax increases for the middle class. They suggest eliminating tax breaks that, whatever you think of them, matter a lot to middle-class Americans — the deductibility of health benefits and mortgage interest — and using much of the revenue gained thereby, not to reduce the deficit, but to allow sharp reductions in both the top marginal tax rate and in the corporate tax rate. It will take time to crunch the numbers here, but this proposal clearly represents a major transfer of income upward, from the middle class to a small minority of wealthy Americans. And what does any of this have to do with deficit reduction? If you are a deficit hawk, the New York Times put up a great interactive reduce the deficit game. 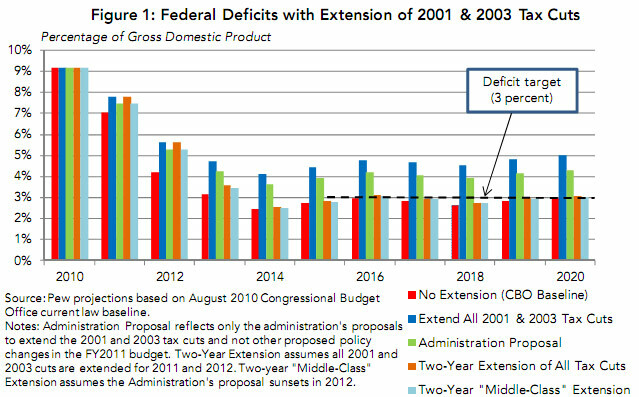 You can choose which policies and programs to cut and see how it affects the deficits. Check out the tax cuts and the effects it has. I balanced the budget in 2 minutes without laying a finger on Social security or Medicare/Medicaid. Give it a whirl! Thank you for showing what can be done with a sensible look at one of the worst entitlement programs around; taxes for the very wealthiest citizens. I like, in particular, your point about the Deutsche claim that equates a recovery with maintaining Bush tax cuts. As you point out, they're not specific. In addition, if tax cuts were such a push in stimulating jobs, we wouldn't be here right now. but that's said, it's clear, from Germany to Finland to just the U.S. history, they simply are not the "be all, end all" that is proclaimed. Somewhere we need to get these people off of more corruption of the U.S. tax code. but this is getting ridiculous! in the 90's, taxes went up, yet huge economic growth occurred. So, I find even the multipliers questionable. (I find all of them questionable, but taxes are particularly, I don't see the historical evidence to these claims). You seem like a smart guy! Let me pose a question. Do you have an opinion as to whether the vast disparity in the rates applicable to capital gains versus the rates applicable to ordinary income is based upon: (1) the idea that low capital gains tax rates act as an incentive to invest and such investments supposedly create jobs and growth; or, (2) the power of the truly wealthy to manipulate the system to their advantage by allowing the majority of their income to be taxed at a rate lower than the Oracle of Omaha's secretary? You remember Leona Helmsley, 'taxes are for the little people Dahling.' The way I have presented it may be a false choice but it seems to me like the right question to ask. If your opinion is that the low rate is to create an incentive to invest, wouldn't the formation of capital also be an important idea to consider when considering raising tax rates on high earners? And, as far as measurement of the effect of lower rates on high earners over time, wouldn't there necessarily be a considerable time lag between capital formation achieved in this way and job creation or economic growth? If, on the other hand, the disparity is based upon the power of the truly wealthy to manipulate the system, shouldn't the president's first priority be to eliminate that ultimate tax dodge? I actually think he talked about it while he was campaigning for president but I just haven't heard much about it since. I forget the ratio but it's beyond belief high (72%?) of trades are flash, or automated trades. Hedge funds, again, making a killing by paying only 15% instead of the real income tax. I think they should up capital gains to Clinton levels (obviously it didn't hurt speculation, think Dot Con), add a transaction tax but turn around and offer up a tax rebate for anyone hiring U.S. citizens, and also tax deferments, shelters, zero taxes, for anyone who invests in the real production economy. i.e. instead of running flash trades, dark pools, or derivatives, instead make it almost tax free if instead, this money is used to say hire 300 out of work engineers to do R&D or start a company. 100 people to start a small manufacturing facility, anything like that so it could be abused as a tax shelter but hopefully make it a real investment vehicle for expanding growth in the real economy. even something like "if you manage to build a business and make it profitable in 5 years, you get a bonus to not pay taxes...at all, for say 10 years", something really intense to pour money into U.S. citizens, people, ideas, innovation, production. Is Buffet a dealer in stocks and bonds? I doubt it or he wouldn't be suggesting that he pays such little tax. I have little problem with a small transaction tax on exchange purchases of stocks. I'm surprised that there is not already such an animal used to fund a more robust regulatory sector, SEC, FTC, Comptroller of the Currency, DOJ antitrust, etc. Your point about athletes not employing people is accurate on its face but not really accurate at a deeper level because those guys use intermediaries to invest their excess money, their capital. They use banks, brokerage firms and venture capital scouts, among others, to get their money out there. Even if they just spend it they're paying people in the businesses which they patronize, hence jobs. Why don't the out of work engineers approach LeBron James or Dwayne Wade to see about venture capital? They'll have to have an idea though, not just be out of work. Check out MIT Professor Nocera's progress in using solar power and a catalyst to break down tap water into it's constituent gases. Even out of work engineers might be able to find uses for abundant and cheap hydrogen and oxygen. Firstly, consider registering and logging in, for that way you can track your replies in the workspace area (a host of features pop up for registered users) and I can see who is asking what. Plus you bypass all of the security and can just write comments once logged in. ok, I don't think current capital gains is justified and it's clear, from the "dot con" bubble that the Clinton era capital gains didn't hurt the stock market at all. I think they do need a wall street transaction tax, esp. for automated, flash trades. The stock market seems to be turned into such a rigged system, those who have super computers, can manipulate delay and information streams, automate, are the ones making money. The thing was supposed to be about investments, not beating the number of hops in a network or seeing who can write the coolest, fastest mathematical predictors and it especially wasn't supposed to be for flipping derivatives in a nanosecond. That said, I think they should create some sort of outrageous money maker tax haven/tax holiday for investment in the production economy. Tie it to new business creation and especially tie it to providing jobs for U.S. citizens. I mean make the pay out "too good to pass up" level of holiday where if an investor takes the risk and builds a real company, hiring real Americans, making real products, they win to the point of major wealth. I think the idea of a tax write off 100% for investments of this type is worth it, but also if that investment generates say $3 million in revenues in 5 years....all of those profits are given a 10 year tax holiday. Or say such a business manages to keep new hires > 50 who are U.S. citizens, perm residents employed at market value or better salaries for 5 years, then that company gets a tax holiday for 10 years, or something along these lines. Need a tax expert to craft the details but the point is to make it ridiculously profitable to employ Americans and create production type jobs in the United States. Include services too, but they must hire only Americans to get these tax breaks and if they fail, ALL tax breaks, from local to state to Federal are revoked and that business MUST pay back taxes. That's another issue, IBM and many companies get tax breaks on the promise of creating jobs by state and local governments. IBM then offshore outsources the jobs instead....yet they still keep the tax breaks. What's wrong with that picture? They violated their promise, they should be nailed! I mean put it over the top to get investors to build plants, hire Americans in this country. Make it too good to be true and so they will stop borrowing cheap money in the U.S. and investing overseas, or plain sitting on it. Robert, check with your accountant, but I believe to qualify for favorable long-term capital gains treatment you must hold the stock 1 year or more, otherwise gains are taxed at ordinary rates for an investor. The rates will vary depending on your income tax bracket. For a dealer, stocks are considered inventory and short term and long term gains and losses taxed at ordinary income rates. I agree with you about targeting favorable tax treatment to U.S. based businesses that create jobs (and taxpayers) here in the U.S.. Give healthy credits based on a company's "on-shore" payroll presence, with healthy credits for capital investment and R & D costs incurred and carried out "on-shore". I would also like to see a tax on current assets (cash, marketable securities, and account receivable). If we forced these big corporation to spend some of that cash they are hoarding on some tax advantaged capital projects here in the U.S., maybe that would get the ball rolling. But for millionaires like Lindsay Lohan(pop-idle star), Maddonna, Lebron James (basketball player) and 1000's of other sports and entertainment millionaires that do not significantly employ others, well, raise the tax rates on these people. Everyone knows more than half of these Hollywood types spend it foolishly anyway, and the sport star can't seem to stay out of the nudey bars. Maybe if they didn't have so much money it would keep them out of rehab facilities and other sorts of trouble. some say that when business taxes are cut, more jobs are created. does anyone think this philosophy really work ? why or why not ? Firstly, one of the great lies on these taxes was they affected small business. No, no, no, they did not! The reason is even with a sole proprietorship, you're taxed on your net, not gross. So, an employee is a complete deduction, it's before your net profits which is where you would pay personal income taxes and self-employment taxes. That said, many corporations these days pay zero taxes, moving funds around through countries and manipulating national corporate tax rates. So, in my view, the only way they are going to get hires equal to a reduction of businesses taxes is to tie those reductions, mandatory, to hiring U.S. workers and additionally remove many of these loopholes which enable multinationals to move profits around the globe and not pay any taxes. But we cannot even get a dialog on what even the corporate and business tax code is. It's ridden with lobbyist's wish lists, loopholes, all sorts of things and the little guy, that's your small business from a LLC/LLP to a sole proprietorship to even small corporations, don't stand a chance. They cannot run around the globe and manipulate national tax codes to their advantage. But bottom line, the entire rhetoric on personal taxes is ridiculous because someone in business for themselves does a schedule C and that's where they deduct their operating expenses before any profits. Their gross is not taxed, their net is. Someone brings in say $500k in gross, but their operating expensive etc. are $300k, then their "income" is $200k. not $500k. We probably need some better reforms for sole prop to be sure that only real profits transfer to income are just that, but that's the basic idea here. So, multinational corporations sitting on billions in cash who already pay zero taxes, or say 2%...giving them yet another tax break with no strings attached, there is no reason for them to hire, more just pocket the profits again, dole them out to executives and possibly shareholders.